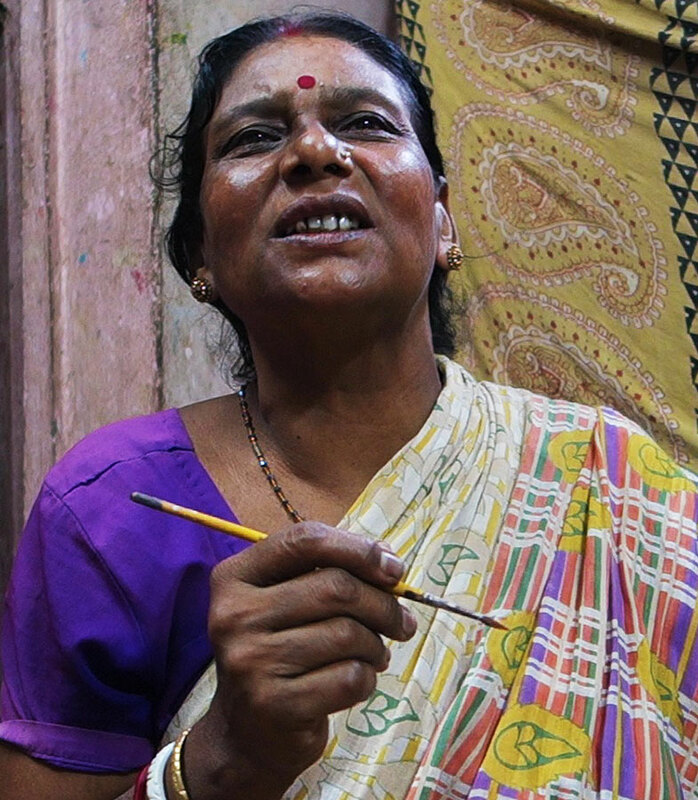 The Fouzdar family of Bishnupur in Bankura are well known as skilled craftspersons. They make the renowned Dashabotar cards, the Durga pats and also craft clay images. 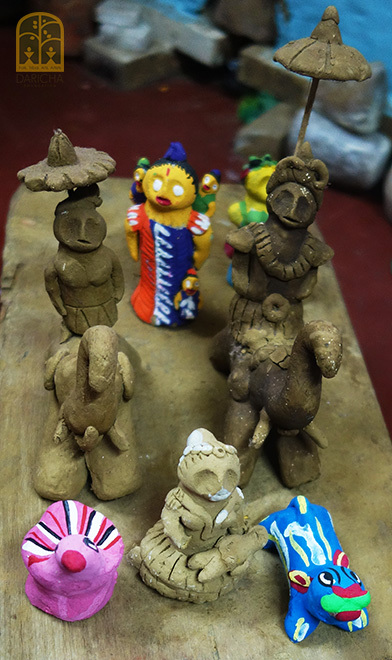 The women and girls of the family specialize in making a particular kind of tiny unbaked clay doll known as Hingli Putul. Hingli dolls are made only by the women of this family. 48 year old Purnima Fouzdar is the wife of Sital Fouzdar`s elder brother, Subal Fouzdar. She has been making these dolls since she came into this family as a young bride of 14. Carefully tutored by her mother in law, she has since shared her skills with the other women in the family, including her five year old granddaughter, Suparna. Hingli derives its name from Hingul or Cinnabar - a toxic mercury sulfide mineral, which yields a red dye, vermillion. This was the primary colour used to paint these dolls in the old days. Today chemical paints in bright colours often substitute natural dyes. Hingli dolls are used as votive dolls for the Jitashtami Broto, a fast observed by mothers 15 days before Durga puja. This practice is observed without the assistance of Brahmin priests, pointing to the non Aryan origin of this festival. On the 8th day of the latter half of the month of Ashshin, mothers in Bengal fast for the welfare and longevity of their children. The origin of this broto is based on folklore: Jimutbahon was a wise king who relinquished his kingdom and went to the jungle to serve his father. One day, he came across an old woman weeping. She told him that she belonged to a family of snakes and was honour bound to give up her son (Shankhachur) as a sacrifice to Garuda, the mythological bird and mount of Lord Vishnu. Hearing this, Jimutbahon promised to save her son and decided to sacrifice himself instead. Garuda, pleased with the bravery and the benevolence of the king, spared his life and promised not to demand any further sacrifices from the snakes. He further granted him a boon by which all snakes sacrificed earlier were restored to life. Thus, the race of the snakes was saved and since then, fasts for the welfare of children have been observed. According to another folk tale, a female eagle and jackal living in a jungle once witnessed women performing the Jitashtami fast and wished to observe it themselves too. While the eagle observed the fast with full dedication and completed it, the jackal was unable to go through her fast and secretly had food. As a result, all children born to the jackal perished a few days after birth while the eagle`s offspring were blessed with long life. The celebration in Bengal probably takes cognizance of both these stories. Thus, carrying a set of Hingli dolls comprising a jackal (with a stolen cucumber in her mouth) and a vulture instead of an eagle (who are to “witness” the fast), along with a haldi stained cloth and offerings of murki (sweetened popped rice or khoi), kalai dal (a kind of split pea), ripe bananas, a guava, custard apple and cucumber on a tray or platter, a procession of women approach a shrine which is usually under a banyan tree. Here a small image of Jimutbahon (locally referred to as Jibitbahon) is worshipped. They believe that he has the power to give children to the childless and protect their children. The deity, often made of unbaked clay by the artisan herself, comprises a male figure astride an elephant, with an umbrella over his head. Since the broto marks maternal love and affection, it also celebrates the folk deity Shoshthi, venerated as the benefactor and protector of children. Thus, if Shoshthi had been propitiated earlier for any boon (manat), a pair of Shoshthi dolls too would be taken along, for each child. Purnima and her family buy their clay from local vendors – usually a full cartload suffices for the two months that they work on these dolls. The doll making usually starts in the month of Shravan (July-August) and stops about 20 days prior to the broto, in the month of Ashshin (September-October) after which the painting process begins. The clay is rolled out into a cylindrical form and then pinched into the desired shape with the fingers. She then uses a bamboo knife or chiari to make incisions on the doll and define the shape. Over time, the style of the dolls have changed, with the girl dolls now wearing frocks! 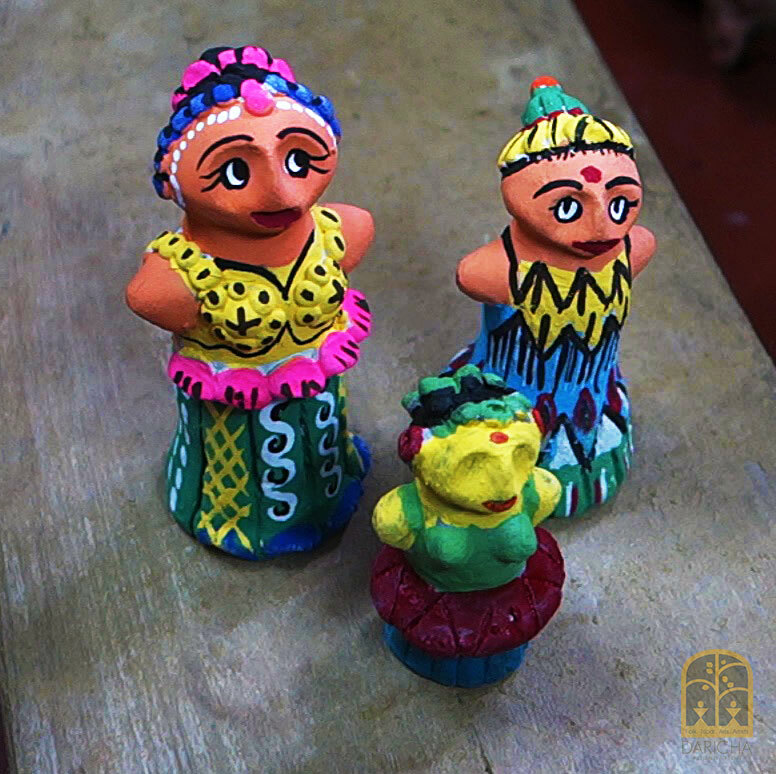 Often, Purnima and the rest of the women in her family make the dolls through the year, to allow the clay to dry nicely and to reduce work load as the festival nears. It takes them about 20 days to paint the dolls. A coat of khori mati (a special kind of white clay) is first applied as a primer, and when dry, it is followed by chemical colours (these days) – yellows, greens, blues, reds and black. The dolls made are sold in the hundreds. Sales start about three days prior to the Jitashtami Broto and soar on the penultimate day. Along with the requisite forms of jackals and vultures, a whole array of dolls are made for the pleasure of the children, who usually accompany their mothers to buy the dolls. These comprise a lively combination of small human figures, animals and deities like Ganesh. Hingli dolls are sun dried, not baked. After the worship, the votive dolls are immersed in any water body nearby.